Adjusting to an unfamiliar program at a university in a foreign country can be stressful for even the most adventurous spirit. But for four Irish exchange students pursuing master’s degrees in engineering, the adjustment to Notre Dame has been seamless. “If there’s anywhere in America where you can feel at home as an Irishman, it’s Notre Dame,” says Shane McCarthy, a native of The Old Head in County Cork, and recent graduate of the University College Cork (UCC). 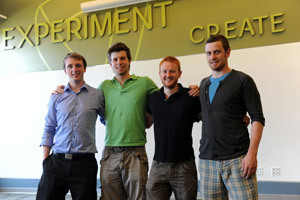 Together with Tomas Collins, Conor O’Donoghue and Shane McQuillan, McCarthy is a participant in Notre Dame's entrepreneurship master's program (ESTEEM), an immersive, year-long graduate program focusing on innovation, entrepreneurship and general business, designed to augment the scientific, technical and engineering skills of its students. The areas of study include biomedical sciences and bioengineering; energy-related research; and nanoscience and technology. Designed to expose students to the innovation process or to the use of intellectual property for the creation of new companies and enterprises, the ESTEEM program offers students the opportunity to study the fundamentals of business while also pursuing advanced science and engineering concepts. Over the course of 12 months, students learn technology entrepreneurship and professional practices so that when they graduate, they will be fully capable of starting their own small companies or creating new opportunities in large corporations. The student exchange program between Notre Dame ESTEEM students and interested students from Ireland was established by Martin Naughton, longtime benefactor of the University. “Having witnessed how education transforms lives and the incredible benefits of overseas study, this is the area on which I wish to focus. The study of new sciences and technologies are essential to the prosperity of society. It will be a tremendous benefit for our talented Irish and American students to have both a European and American qualification from leading universities on both sides of the Atlantic,” Naughton says. As Naughton Fellows, four graduating students from Notre Dame are supported to attend one of the Irish universities to study a select master’s program, while four graduating students from the Irish universities are supported to attend Notre Dame to study a select master’s program. The master’s fellowship includes a tuition scholarship and a stipend of $20,000. “This program allows us to enhance our technological backgrounds while learning accounting and other valuable business skills,” says McQuillan, who comes from Carrickmacross in County Monaghan. As a Naughton Scholar at his undergraduate institution, Dublin City University, McQuillan had been familiar with the ESTEEM program for several years. “I knew it was a great opportunity that I wanted to be a part of,” he says. Each student in the ESTEEM program completes a capstone thesis project, working with a chosen faculty member, who will seed an idea for the student’s project. The thesis is based on an existing or new Notre Dame invention, patent or disclosure and involves in-depth evaluations of the invention and associated technology. McCarthy, Collins, O’Donoghue and McQuillan specialize in different areas of engineering: McCarthy focuses on energy-related technology, Collins in biomedical engineering, O’Donoghue in civil engineering and McQuillan in health-related technology. Each hopes to take his capstone thesis project from concept, to product, to market. In the photo: Naughton Fellows Shane McCarthy, Tomas Collins, Shane McQuillan and Conor O’Donoghue in their work area at Innovation Park. Originally published by Susan Guibert at newsinfo.nd.edu on August 31, 2012.